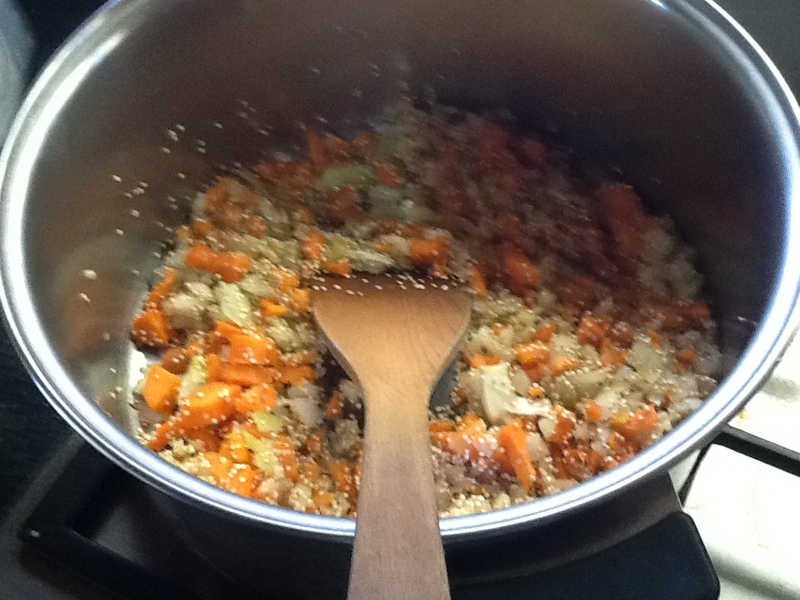 Yummy Vegan Creations: Quinoa and Vegetable Vegan Stew! Quinoa and Vegetable Vegan Stew! I'm freezing. Winter is coming. Kasey and I hosted a dinner party last weekend and we puzzled over what we could make. No vegans were attending BUT we can't resist preparing a beautiful vegan menu. It's such a nice feeling when people that expect vegan food to be bland and tasteless and boring are proven wrong :P We decided on a stew because what's better when you're cold and want something warm and hearty. This stew was so fun to make, and simple. The chopping took a while but if you have a good knife or a food processor that would help a lot. 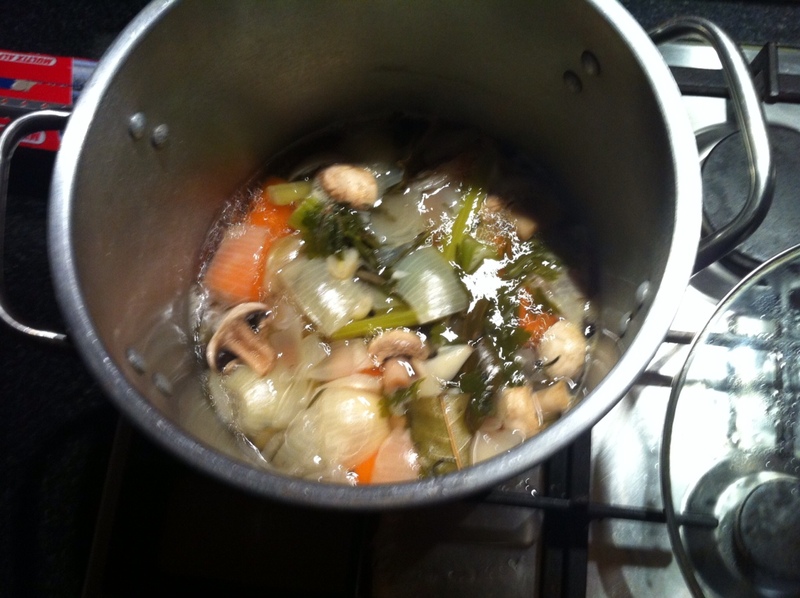 We started with making the stock. I think making a stock can seem a bit intimidating if you've never done it before. It creates the base of the stew and that's where your base flavor starts. I'll break this recipe into two parts to simplify. Keep in mind, that if you are low on time it is perfectly okay to buy a pre-made vegan stock at the store, but we found it fun and delicious to make our own. *We included mushrooms in our stock, but removed them after about 10 minutes when we realized they could be overpowering. Throw all of it in a big pot with a lid. Heat on high until boiling. Then turn the heat down to low and let it simmer for about 2.5-3 hours. We ended up letting it cool over night just for extra flavor development. Strain completely (you might be able to find another use for the leftover vegetable, Kasey happily ate the carrots on their own they were so good :D). You'll need about 2 cups of stock liquid for your stew. Add the chopped carrot and onion and garlic to your pot, with the macadamia oil. Cook it off just a bit then add the quinoa. Now add the stock, water, and the tomatoes. Simmer on medium heat for about 10 minutes. Finally, add in the cabbage and the kale and the sweet potato. Put in the spices, the cumin, the rosemary, the basil, and your salt and pepper. We taste as we cook and season accordingly, so our measurements might not be exact, but remember that you can always add more if you think it needs it. Turn the heat down and continue to cook for 15-20 more minutes. We checked on it constantly just to make sure the flavors were right. It smelled so nice :) Basically it's done when the sweet potato is cooked. Enjoy! I came across quinoa today. I've tasted it before, but not cooked in vegetables like this. I also found kale! Neither are at my normal local supermarket. So I can try this, woot! but in much simplified form without making stock (because I'm only cooking for one). Thanks for the inspiration! Lovely! And I'm a complete beginner, this being the first stew I've ever made. I used olive oil instead of macadamia, boiled tomatoes as stock, and added the sweet potato a bit earlier than advised and was wondering if it would have better been added even earlier? I already knew quinoa was very satisfying. But it also seems to get tastier the more you chew on it, or is that just me? :) Ace! Oh, and I topped it up with some chopped radish too.